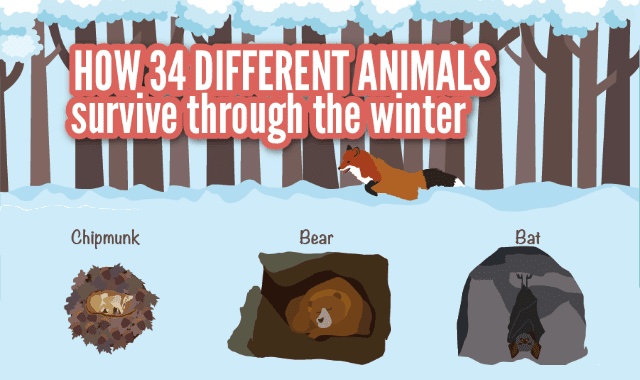 How 34 Different Animals Survive the Winter #Infographic ~ Visualistan '+g+"
When you're making the walk to your heated car after a long day of work, and it's dark and freezing out, have you ever wondered how the animals survive in the winter out there? While most know that various species of birds will always migrate thousands of miles to hit the warmer climates, you may not have known that whales and butterflies often do the same. With a Moose, for example, they shed their heavy antlers to conserve energy in the winter. Even more fascinating, perhaps, is that garter snakes gather in a pile of dozens to hundreds (sometimes thousands) under shelter like logs, rock piles, and spaces underneath the road in order to stay warm. This infographic from Alan's Factory Outlet takes a look at various animals, birds, and more, and how they survive the harsh cold in the winter.